In this training video we look at the BC Wind Drift Formula which is based on the BC of your projectile, making it surprisingly accurate. The BC Wind Formula works well for those using MILs and can be modified to suit YOUR rifles ballistic data. In this video lesson we look at the BC Wind Drift Formula and how it is used to account for wind deflection when shooting Long Range. “Wind Formulas” are often used by Long Range shooters in “time critical” situations where there simply isn’t time to use their ballistic solver or refer to wind data cards. The BC Wind Drift Formula is one of the more common formulas. – The Rule of 9’s Wind Drift Formula. – The British Wind Drift Formula. This video is a basic training package delivered using PowerPoint. By the end of the lesson you will have an understanding of the BC Wind Drift Formula and how to use it to account for wind deflection. P.S. Please take the time to share this post. P.S.S. 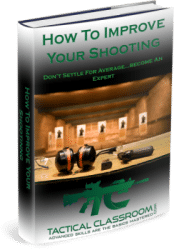 If you haven’t done so already, subscribe to Tactical Classroom score a FREE copy of our eBook, How To Improve Your Shooting. Join the Tactical Classroom VIP Team and get the latest updates, special offers, and more! Your email address is safe with us..
Live & Online Courses are Available!